Covers the whole spectrum of this exciting area of guitar playing. Careful grading enables beginners to progress through this course playing well-known songs, as well as learning the technical aspects. 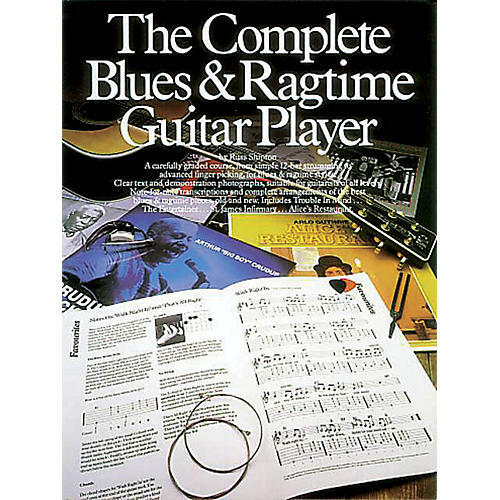 Songs: A Basic Blues · 'a' Simple Blues · 'a' Twelve Bar · Alice's Restaurant · Bounce Blues · Candyman · Candyman Blues · Cocaine Blues · Come Back Baby · Deep River Blues · The Entertainer · Extension Blues · First Time Blues · Gee Rag · Good Morning Blues · Half-way Rag · Harmony Blues · Hesitation Blues · Horizon Rag · How Long How Long · I Believe I'll Dust My Broom · In the Evening (When the Sun Goes Down) · Kansas City · Keep on Truckin' Mama · Kick-off Rag · Last Train and Ride · Mark Two Blues · San Francisco Bay Blues · See See Rider · She's Funky That Way · Sister Kate's Syncopated Dance · Slide Blues · St. James Infirmary · Steam Roller · Sugarbabe · That's All Right · Trouble in Mind · Vestapol · Walk Right In.